You are here: Home / The Writing On My Wall... / 10 Gifts for $10 or Less! Hopefully you are better at saving money for gifts than I am or at least better at holding on to that money once you get it saved! 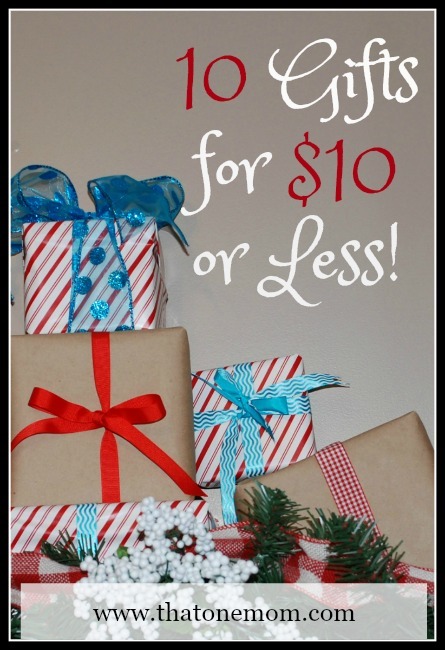 Just in case you are not though, today we will be talking about inexpensive gift ideas–specifically 10 gifts that cost under $10 each. I’m all about gifts like these this year, as we all have too much stuff and spend too much money for it! I know I’ve said this before (or at least I’ve meant to), but what you give as a gift depends on your budget and what you want to give. I fully believe that if you have it in your mind to spend $300 on someone, that you probably will spend that amount in the end–even if it’s just on little things that add up or you wind up putting it on a credit card. So if you set a limit, please do everything in your power to stick with it. I know it’s hard, but it’s worth it. If you have a lot of craft supplies and enjoy doing that sort of thing, there are numerous crafts you can make and give. Today’s post is based on the assumption that we don’t have the time or resources to make homemade stuff! Gift Cards. Gift cards are awesome and you can get them for pretty much any amount you can dream of! One suggestion is to use programs like Swagbucks and MyPoints to earn points throughout the year that can be cashed in for gift cards from various stores. Then pair the gift card with some candy or a mug of hot chocolate mix to make it a little more special. Movie Night Basket. Purchase RedBox codes online and include them in a basket with candy, popcorn, and maybe some soda. These can actually be made for less than $5 if food items are bought at a place like the Dollar Tree–one code, two boxes of candy, one popcorn, and a drink. We love RedBox at our house, so this is an ideal gift for us!! Board/Card Game. Some of the best times we’ve had have been spent playing board or card games! There are so many that are great for the whole entire family…Uno, Trouble, Pictionary, Yahtzee, Taboo, and Phase 10 are some favorites around here. A less expensive game can be put into a basket with some snacks for a Family Fun Night too! Books. I’m a big proponent of books. I give them as gifts for just about all occasions. Christmas books, cook books, craft books, board books, and chapter books are all very appropriate for giving. Book Outlet happens to be one of my favorite sites for buying books. They offer email discounts and right now you can get $5 to spend on books, so make sure to sign up! Homemade Coupons. Okay. So this is cheating a little. It is a crafty thing, but it is not something that requires an extreme amount of work. The best thing is that they can be customized to each recipient and are extremely inexpensive. Other than the cost of paper to write it on, a coupon is basically free. The coupons can be for things that won’t cost you anything–like a night of babysitting or a car wash. Or for a few extra dollars, you can offer a home-cooked meal. This gift probably requires a little imagination, but it is a great way to make someone feel special! Kitchen Utensils. Buy an oven mitt and fill it with as many kitchen tools as you can for up to $10. Wrap it with a piece of ribbon and voila! Just for future reference, this is probably not a great gift for someone who has no interest in cooking. Photo Gifts. This one may take a little doing, but almost all photo companies offer specials close to the holidays. Combine discount and free shipping coupons and it should be easy to wind up with gifts for under $10. Also, don’t forget to visit sites like Ebates and TopCashBack for extra savings. Recipe Ingredient Basket. This is so simple and has so much potential! Simply choose a recipe and purchase the ingredients for it. A favorite of mine is to put a box of pasta, a jar of sauce, a spaghetti server (looks like a weird slotted spoon), and a couple of dish towels into a basket. You could also add a nice container of Parmesan or a gift card if the budget permits! Snowman Kit. This is another simple one and the items in the kit don’t even have to be brand new. For a Snowman Kit, you will need a scarf, hat, extra large buttons for eyes, a carrot or something similar for a nose, and any other thing that would look cute on a snowman! This is another that is only limited by imagination. Include other accessories like ear muffs, jewelry (fake please), purse, boots, or mittens. The only other thing that is needed is snow, but unfortunately they will be on their own for that one!! These are just a few ideas that can save you money while still allowing you to give thoughtful gifts. Do you have any favorite ideas for inexpensive things to give?